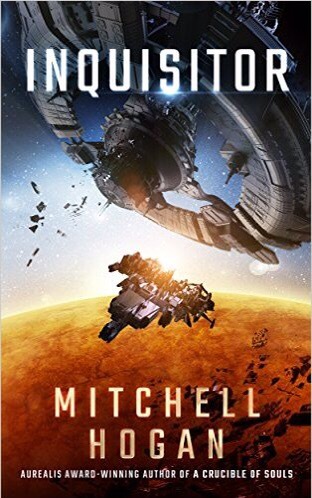 “Inquisitor” eBook was published in 2015 and was written by Mitchell Hogan (http://mitchellhogan.com). This is Mr. Hogan’s third novel. I received a galley of this novel for review through https://www.netgalley.com. I categorize this novel as ‘R’ because it contains scenes of Violence and some Mature Language. This Science Fiction Mystery novel is set in the far future. The primary character is Angel Xia. Xia is an Inquisitor – which is a special criminal investigator. Xia, and most people in this time, have implants that give them augmented senses and access to Lon-line resources. Xia has had issues with partners – they seem to get themselves killed when working with her. She and her current partner get a case that appears to be an accident, but Xia has questions. Before long her latest partner is murdered and a person she is interviewing is killed in front of her. She finds herself framed for murder and other crimes and is being sought by law inforcement. As Xia continues her investigation trying to clear her name, she gets a message from a young girl, Charlotte, asking for help. The girl is somehow tied to the murders. Xia is able to rescue Charlotte, but she is not fully what Xia expected. Now that Xia and the girl are together there is even more effor to find and kill Xia. Xia struggles to keep one step ahead of those that are after her, and to keep Charlotte safe. I thought that this was a good 7.5 hour read. It was a fair mystery set in a future world. The world is a very corporate centric society. I liked the character of Xia and would like to see more books with her. She was a very strong character. I give this novel a 5 out of 5.